The Center for Journalism Ethics at the University of Wisconsin-Madison is partnering with the Poynter Institute, Google News Lab, DJI Drones, the Drone Journalism Lab at the University of Nebraska, and National Press Photographers Association to host a hands-on drone journalism training in Madison June 16 to 18, 2017. Unmanned Aerial Vehicles (UAVs) — known to most as drones — present tremendous opportunities for journalists. They can be used to report on environmental issues, natural disasters, and other news issues and events. But they also pose important concerns, including safety and privacy. This hands-on training will not only prepare journalists to successful earn FAA certification to fly, but also focus on the law and ethics involved. Thanks to Google’s generous sponsorship, the three-day training is offered for $295. Journalists, journalism educators and serious students preparing for drone flight are welcome to attend. Please visit http://about.poynter.org/training/in-person/drones-17 for more information. ST. PETERSBURG, Fla. (Jan. 30, 2017) – The Poynter Institute, Google News Lab, Drone Journalism Lab, National Press Photographers Association and DJI have unveiled an innovative program to train journalists in using drones, or unmanned aerial systems, for their news coverage. The program, which features hands-on workshops and online teaching, is powered by the Google News Lab. Hands-on workshops, offered from March to August at universities from coast to coast, will offer training on safe drone operations as well as information that drone pilots need to study for the Federal Aviation Administration’s new Part 107 Drone Pilot’s Certificate. In addition, the three-day workshops will focus on the legal and ethical issues of drone journalism, community best practices and coordinated operations in a breaking news environment, as well as explore ways drone photography can be used in innovative storytelling. 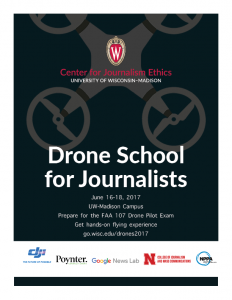 Poynter will be leading these workshops in partnership with the Drone Journalism Lab at the University of Nebraska, the National Press Photographers Association (NPPA), the Google News Lab and DJI. Additional online training will be available later this year via Poynter’s e-learning platform, News University. The workshops also will include NPPA’s legal counsel Mickey H. Osterreicher, who has worked for years speaking on behalf of journalists as the federal government drafted regulations for where and when drone journalists could fly. “NPPA has been at the forefront in advocating for the use of drones for newsgathering. With that opportunity comes an inherent role of operating them in a legal, safe and responsible manner,” Osterreicher said. The legal landscape is especially complex because state and local governments increasingly are imposing their own restrictions on drone flights. The program also will feature hands-on introductory flight training sponsored by DJI, the global leader in drone technology and 2016 winner of NPPA’s Lemen award for technology innovation in photojournalism. “We are thrilled to join with Poynter to empower journalists with state-of-the-art technology that inspires innovative storytelling,” said DJI policy lead Jon Resnick. Four universities are serving as hosts and partners for these workshops: the University of Georgia Grady College of Journalism and Mass Communication, March 17-19; Syracuse University Newhouse School of Public Communications, April 21-23; University of Wisconsin-Madison School of Journalism and Mass Communication, June 16-18; and the University of Oregon School of Journalism and Communication in Portland, Aug. 18-20. In addition, the Google News Lab will support a limited number of travel scholarships for members of the National Association of Black Journalists, the National Association of Hispanic Journalists, the Asian American Journalists Association, Native American Journalists Association and NLGJA, the Association of LGBTQ journalists. Participation at each hands-on workshop will be limited to the first 60 people to register. Workshop details are available at http://about.poynter.org/training/in-person/drones-17. Google’s mission is to organize the world’s information and make it universally accessible and useful. Google created the News Lab to support the creation and distribution of the information that keeps people informed about what’s happening in the world today—quality journalism. Today’s news organizations and media entrepreneurs are inventing new ways to discover, create and distribute news content—and Google News Lab is here to provide tools, data and programs designed to help. The College of Journalism and Mass Communications at the University of Nebraska-Lincoln established the Drone Journalism Lab in November 2011 as part of a broad digital journalism and innovation strategy. Journalism is evolving rapidly, and journalism education must evolve with it, teaching new tools and storytelling strategies while remaining true to the core principles and ethics of journalism. The lab was started by Professor Matt Waite as a way to explore how drones could be used for reporting. The National Press Photographers Association (NPPA) is the leading voice advocating for the work of visual journalists today. As the voice of visual journalists since 1946, NPPA has led the fight to promote and protect integrity and excellence in visual journalism. Its code of ethics stands for the highest integrity in visual storytelling. Its advocacy efforts put NPPA in the center of today’s thorniest issues in support of journalists throughout the country, while its educational initiatives seek to prepare visual journalists to meet the challenges of the profession. In light of these challenges, the work of NPPA has never been more vital than it is today. Founded in 2006, DJI is a global industry leader in high performance and easy-to-use aerial camera systems for recreational and commercial use. DJI products empower people of all skill levels to take to the skies and capture images that were once out of their reach. The company places heavy emphasis on R&D and innovation, and is committed to bringing aerial photography and videography to all. DJI currently has business operations in the United States, Europe, Japan, Hong Kong and mainland China.